Tender plants can be cut back, lifted and stored in a dormant state, or protected with a covering of organic matter (known as mulch). The decision on whether to lift and store or leave them outside under mulch depends both upon the plant and the local climate. 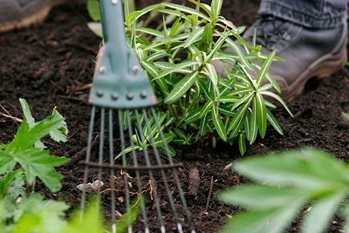 In milder areas of the UK and in sheltered, well-drained, parts of the garden, it may be possible to cut back the tops of tender plants, leave them in the ground and cover them with a thick mulch to protect them over winter. In very cold or exposed areas, even hardy perennials may need the protection of mulch over winter. Tender plants need protection at the first warning of frost, usually between September and November. Specific cultivation practices are also used to protect plants from winter damage, and these are started from mid-summer onwards. See our advice on preventing winter damage for further detail. Cannas, dahlias and pelargoniums (commonly known as geraniums) can be lifted and stored in a semi-dormant state over winter. Where lifting and storing are not necessary, then thick, dry mulch over the crown of non-woody plants may be all that is needed for winter protection. See our advice on pelargoniums for information on overwintering these popular garden plants. Begonia tubers are lifted and stored in the same way as dahlias. Gladiolus corms can be lifted and stored like bulbs. See our bulbs page for further information on lifting and storing bulbs. Where lifting and storing are not necessary, a thick, dry mulch can be used for protection. In mild areas, cannas and dahlias can be overwintered like this, as can deciduous Agapanthus (those that lose their leaves in winter) and globe artichokes. The young shoots of lilies can be mulched to protect them from late spring frosts. The tender shrub Melianthus major can be cut back to ground level and then mulched for winter protection. Suitable mulching materials include straw, garden compost, chipped bark or well-rotted manure. See our advice on mulches and mulching for further ideas. These need to be wrapped and protected in situ. See our advice on overwintering tender plants under wraps for further information. Rots can develop in stored tubers, corms and rhizomes. Keeping them dry and well ventilated is important. Plants protected under mulch may come into growth and flower a little later than those lifted, stored and replanted in spring.